Lamberts Premtesse is a high strength multi-nutrient developed for women of menstruating age both for adverse premenstrual symptoms, and as a ‘core’ supplement for other female disorders. 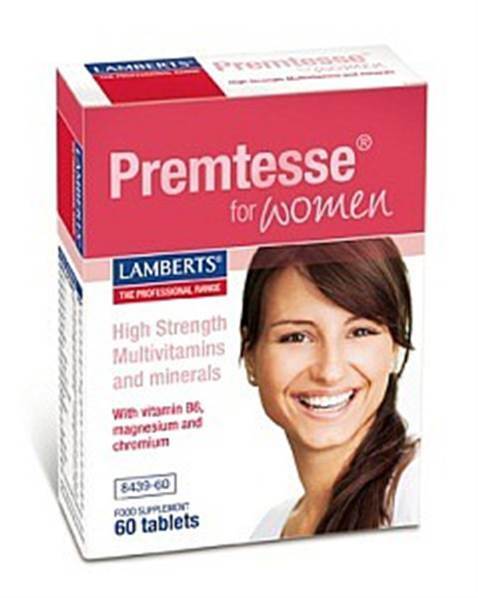 Lamberts® Premtesse® is a high strength multi-nutrient formula especially developed for women of menstruating age both for adverse premenstrual symptoms, and as a ‘core’ supplement for other female disorders. It contains 20 nutrients, including vitamin B6 that is known to be of help to menstruating women around the time of their period. A relevant level of magnesium (400mg per 2 tablets) since the effects appear to be dependent on the dose of magnesium used and 400mg per day seems to be the ideal level and appropriate levels of trace minerals such as chromium (for sugar cravings), zinc and iodine. Premtesse® can be used alongside other food supplements such as Evening Primrose oil and Starflower (Borage) oil. A pink oval coated tablet. DiCalcium Phosphate Cellulose Hydroxypropyl Methylcellulose Tablet Coating (Colours: Titanium Dioxide & Iron Oxides Hydroxypropyl Methylcellulose) Silicon Dioxide Stearic Acid Magnesium Stearate and Cross linked Cellulose Gum. This product is not recommended for pregnant or lactating women. This product contains iron which if taken in excess may be harmful to very young children. Keep out of sight and reach. Long term intake of this amount of Vitamin B6 may lead to mild tingling and numbness. Health4youonline.com is an Lamberts Approved Retailer for their healthcare supplements. It is important that you buy from an authorised retailer (see why). The details below are supplied by Lamberts but we think it is important that we give our view about our experiences with Lamberts. We decide on the brands we stock based on a number of factors. First the quality of the product. it is vital that the ingredients are of the highest possible quality and that the manufacturing process ensures the maximum amount of nutrients are passed through to the eventual product. We take a great deal of comfort from knowing that Lamberts Healthcare supplements are one of the main choices of healthcare professionals for the clients and patients because the quality is so high. That is why they are said to be of professional quality. But for us, it is also important that there services to us is top notch. There supply of products is very speedy to that even when we are out of stock we can quickly replenish supplies. That Lamberts sell so many of their supplements also ensures that the sell by goods are always excellent. Because we are an Lamberts Approved Retailer we are in the best position possible to be kept informed of developments, new products and formulation changes and they ensure that our staff are well versed in their products. Whenever we have customer queries however, we always ensure that we refer to the Lamberts clinical team before we provide an answer. In short, therefore, we find Lamberts Healthcare to be an exceptionally innovative high quality brand and with whom we are proud to work. Lamberts High Strength Pure Fish Oil, Lamberts Acidophilus Extra 10 , Lamberts CoEnzyme Q 10, Lamberts Colladeen Derma Plus, Lamberts Glucosamine & Chondroitin Complex, Lamberts Glucosamine Complete, Lamberts Magasorb, and Lamberts Multiguard Osteoadvance 50+ although these are but a few of a large and diverse range of health supplement products that you can find here. You should always be careful of any product you intend to put into your body. Vanderbell Health is a Lamberts Approved supplier. This is important because it means that you can rely on the fact that supplements are sourced direct from Lamberts, are stored in proper conditions, well within "best before" dates and genuine. Beware Lamberts products sold by retailers who do not show that they are approved. It means they do not source their goods from Lamberts and the goods may not be genuine or might be old, bankrupt stock. Note: Lamberts DO NOT allow their products to be sold on eBay or Amazon and any you may find there are NOT supplied by Lamberts. Lamberts Health Supplements - Correct Potency supported by scientific evidence. Lamberts® philosophy of healthcare is all about ‘sound’ science - they only develop products that are at the right potency and supported by a valid scientific rationale. (In our experience they also provide the best potency and prices). Established in 1982, Lamberts® is the UK’s leading supplier of specialist dietary supplements to Practitioners and Pharmacists who use nutrition and herbs in healthcare. We offer an extensive product range including vitamins,minerals, herbs, multiple formulas, fish oil and glucosamine as well as more specialised products. Lamberts products are not just confined to the UK; but to practitioners in over 39 countries around the world and have several distributors working overseas, predominantly in mainland Europe including Spain, Greece and the Netherlands. So if you have been recommended to take Lamberts® products, then you can rest assured that you will be taking quality products endorsed by professionals in healthcare. Vanderbell Health and health4youonline are approved by Lamberts to sell their products, which are always bought direct from Lamberts - never from an alternative wholesaler, so you can be sure of the quality, that you are buying a genuine Lamberts product, that it has been stored under optimum conditions and that the product is well within the "sell by" date. Lamberts® is the leading supplier of specialist dietary supplements to pharmacists and they handle thousands of orders every month. Lamberts products are routinely prescribed by GP’s and consultants and they offer a fast efficient service for fulfilling orders, however large or small they are. So even where we are iut of stock we can usually get restocked next day. Lamberts offer an extensive product range of over 150 products including vitamins, minerals, herbs, multiple formulas, amino acids, digestive aids, fish oil and glucosamine as well as more specialised products such as VeinTain and Refreshall. Lamberts product range is unique in that it is made to full GMP standards. The products are formulated to offer relevant potencies and are supported by a valid scientific rationale. Lamberts believe that every single raw ingredient in a Lamberts product is as important as the finished product itself. So they are meticulous in the tests they carry out and ensure that every product that is manufactured is subjected to a series of rigorous tests to ensure they meet the specifications given on the label. Firstly, the raw materials are tested for quality, purity and potency, then samples of products are taken and tested even while the product is still being made and then a final check is carried out on the finished product. This commitment has enabled us to produce products of a quality that others can only aspire to. Premium quality products need to provide the correct potency since dosage is the key to success when using nutrition and herbs in clinical practice. You can have selected the right nutrients but get the levels wrong and you won’t get the results you hoped. And whilst you’d be right in thinking that getting the dosage right is a fundamental requirement in practice, it is surprisingly difficult to achieve this by using many of the supplements on the market. This is why we pay such careful attention to our selection of brands. At Lamberts they start with dosage. Lamberts philosophy of healthcare is all about ‘sound’ science - they only develop products that are at the right potency and supported by a valid scientific rationale. Indeed it is the potency of their products that truly sets them apart from most other brands and enables you to be able to put your trust in Lamberts products. Great products need to be perfectly labelled too and Lamberts has pioneered the accurate labelling of dietary supplements. Lamberts takes considerable care to use the correct terms for all the ingredients in their products and they do not hesitate to declare everything that is used. What they say on the label is an honest representation of what is in the product. To be sure that their tablets or capsules contain the active ingredients specified, they know that certain inactive ingredients need to be used. It is very difficult, if not impossible, to produce food supplements without using some inactive ingredients and products whose labels do not show any are in our opinion, either inaccurately made or inaccurately labelled.